TEA BENEFIT Heart Ailments: The regular consumption of black tea can help repair the coronary artery dysfunction in many heart patients. 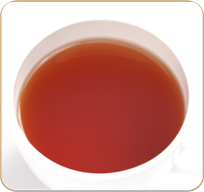 Therefore, black tea drinkers are at a decreased risk from any cardiovascular diseases. Diarrhea: Black tea has a healing effect on intestinal disorders due to the presence of tannins. It is advisable for all diarrhea patients to sip plain black tea slowly for maximum benefits. Asthma: Hot and brewing liquids, in general, bring relief to an asthmatic condition. Similarly black tea is extremely beneficial to asthmatics, as it expands the air passage, allowing patients to breathe more easily. DESCRIPTION The well worked, brown leaf with a high percentage of buds is a sign of its exceptional quality. A well balanced flavor and aroma, satisfying the senses. However, the most remarkable feature of this top Darjeeling is its taste.